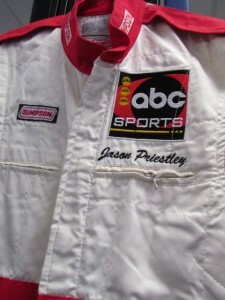 Royal City Jewellers & Loans Ltd. has acquired a Simpson custom racing suit that was made specifically for Jason Priestley. Simpson custom racing suits are made to specification at their state-of-the-art suit manufacturing facility in Harbor City, California. 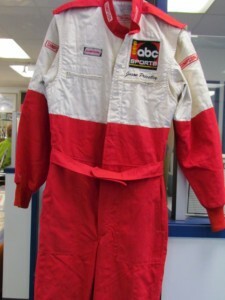 Racing requires top level safety performance of a fire retardant suit. Simpson offers SF1 to SF1.20 certified suits in both custom and standard models. Jason Priestly, a Canadian-American actor and director, was born in Vancouver, B. C. on August 28, 1969 and graduated from Argyle Secondary School in North Vancouver. His hobbies include race car driving. He rallied a Toyota Celica All-Tac ST185 in the SCCA Pro Rally Series during the early to mid-1990s. He provided commentary and interviews of racers for ABC’s TV coverage of Indy Car racing. 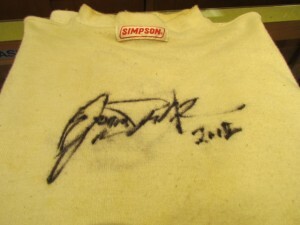 In 1999, he participated in the first Gumball 3000 rally, driving a Lotus Esprit V-8. On August 11, 2002, he was seriously injured during a practice run at the Kentucky Speedway when his pro series car crashed into a wall at 180 mph. 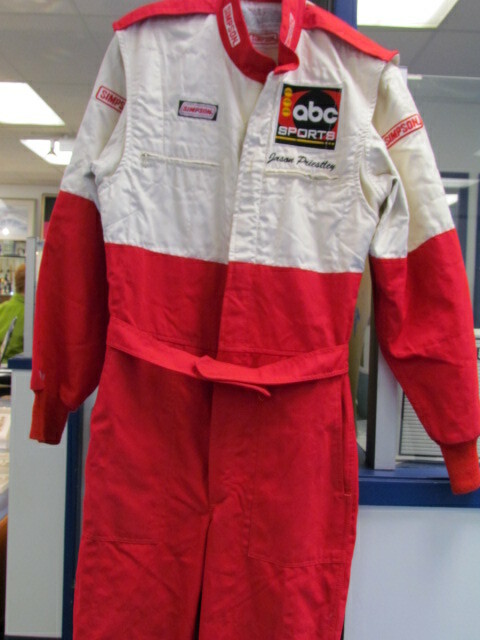 This custom made Jason Priestley racing suit is on display at Royal City Jewellers & Loans Ltd., along with his autographed racing shirt. The autograph is dated 2012. Thank you for excellent service. For always looking after my stuff. After all the many years of service RCJ is still the very best! Cheers! !